Tomorrows eid picnic party has been cancelled due to numerous cancellations and the heat warning. May Allah forgive me for any errors I might make in writing this article, but because it's Zakah Al-Fitr time, the time is NOW to get this info into your hands. And to forward to other Muslims so they can do their Ibadah correctly. What is Zakat ul-Fitr? Think “Iftar”, Zakat Ul-Fitr is the charity that we pay at the end of Ramadan. Ibn `Umar reported that the Prophet (sal Allahu alayhi wa sallam), made Zakat al-Fitr compulsory on every slave, freeman, male, female, young and old among the Muslims; one Saa` (a measurement: four double handfuls) of dried dates or one Saa` of barley. Some people go to Eid prayers and drop money into the donation box thinking that they have paid their Zakat ul-Fitr. No, Zakat al-Fitr, which is food, must be in the hands of the needy family BEFORE Eid prayer. The Companion of the Prophet, Abu Sa`eed al-Khudree, radi Allahu 'anhu, said, "In the Prophet's time, we used to give it (Zakatal-Fitr) as a sa` of food, dried dates, barley, raisins or dried cheese". Some people mistakenly give their Zakah Al-Fitr to a charitable building project: like the building of a Masjid, or Islamic school. There is a difference of opinion on this issue, but suffice it to say that the spirit of Zakah Al-Fitr is that the needy should have plentiful food on Eid. All eight types of recipients of Zakah mentioned in the Quran are HUMANS, not “building projects”. In sha Allah, if you have Zakah questions, I encourage you to seek counsel from your local sources of knowledge. People you can speak to directly. p.s. I've got an exciting announcement to make tomorrow so stay tuned and be sure to check your inbox tomorrow for an email from me. p.p.s. if you got this email from a friend (may Allah reward you both for sharing and gaining knowledge! ), you can sign up to get the emails yourself here. Click on the title to read the email. hand side of the Halaqa Blog under Amanah Sisters, or click here. Sister Sara read aloud an article called “Ramadan my dear guest, I’m sorry” To read this article, click here. There are still a few days to RSVP in sha Allah. In sha Allah, our next Halaqa will be held on Wednesday August 5th, 2015 outdoors at the Celebration Square in front of the Mississauga Library from 10 am-12 noon.. Sisters and children are encouraged to attend. Note: Sisters present decided to compose a basic dua that is specific to our Halaqa and one which will be the standard opening dua from now on in sha Allah. Nice to have something the children present can recognize and recite as well. Reading together “breaks the ice” for sisters who might be shy. Most important surah for new sisters to learn and recite. Is is a Surah that all present can say. This is a new section we’ve added to the Halaqa. 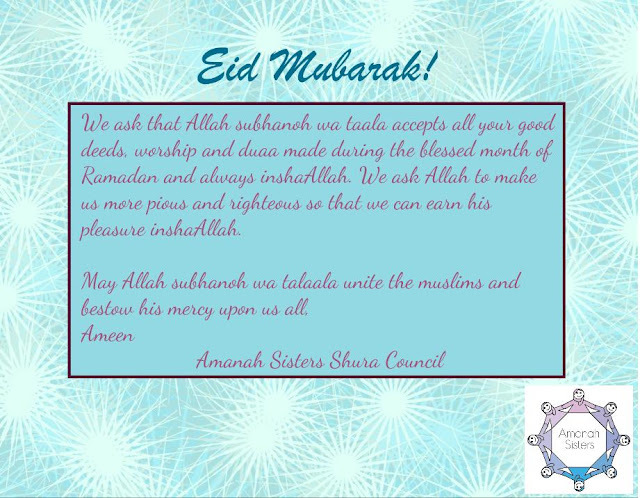 It is items that Sisters have sent to us via, email, whatsapp, etc. We encourage those sisters who can’t attend the Halaqa in person, to participate via this new addition. explanation of some verses from each Juz per day. It will hardly take 5-10mins! Sister Sara presented an updated dua app produced by AlHuda International. Click on the relevant link below to get your own copy. Click here to see a selection. Today we presented two dua’s. 103 - "O Allah, verily You have created my soul and You shall take it’s life, to You belongs it’s life and death. If You should keep my soul alive then protect it, and if You should take it’s life then forgive it. O Allah, I ask You to grant me good health." Allâhumma innaka khalaqra nafsî wa anta tawaffâhâ. Laka mamâtuhâ wa mahyâhâ. In ahyaytahâ fa-hfazha, wa in amattahâ fa--ghfirlahâ. Allâhumma inni as'aluka-l-câfiyata. 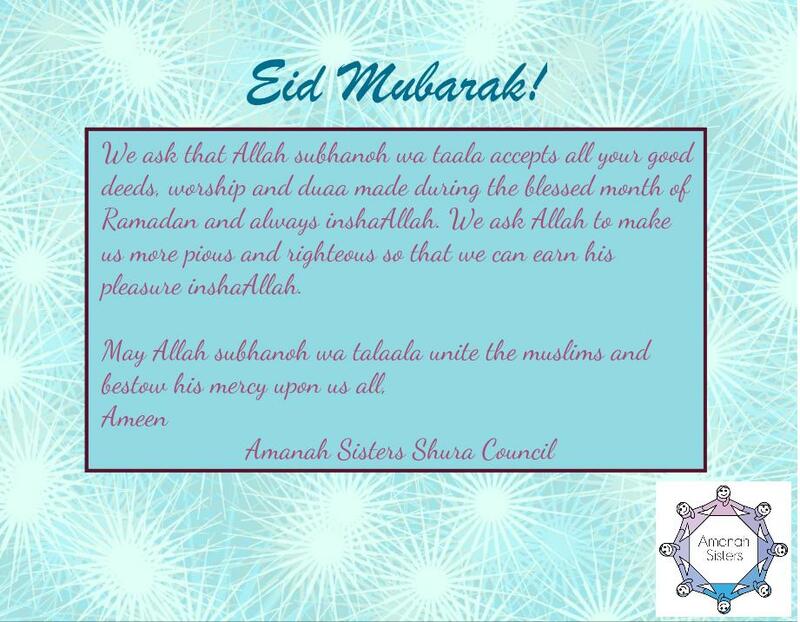 Amanah Sisters encourages our members to attend our upcoming Eid Celebration. Sisters present decided to move our next Halaqa ahead by two days (due to the timing of the end of Ramadan and Eid). Therefore in sha Allah, the Halaqa will be held on July 14th, 2015 outdoors at the park located nearby our headquarters. Sisters and children are encouraged to attend. Tuesday, July 14th, 2015 Bud Cleary Park from 10 am to 12 noon. Sister Sara chose two videos for our viewing. The second video was too long to watch during our Halaqa, but we wanted to share it with our sisters. In sha Allah, they will find it beneficial.